A new-ish gallery space is showing an exhibition entitled Windows, and it brings together two artists I’ve met running galleries in different places. The Artists Workhouse in Studley is being developed by Dawn Harris, an artist currently studying for her MA in Fine Art at Gloucester University, and who previously was artist in residence at Ragley Hall where she also became Director of Ragley Gallery and Studios. There were several fun openings there, where visitors drove up to the stately home to enjoy drinks in the luxuriant setting, and then visit the exhibition in the atmospheric stable block. This show is curated by Matthew Macaulay, a Coventry University art graduate who amongst other things set up the Pluspace Gallery in Coventry which made use of an empty space overlooking Broadgate and showed some good exhibitions, before he went on to work under the Pluspace banner for various other projects. But good things at Ragley and Coventry city centre both came to an end, and Dawn has now moved on to establish The Artists Studio in Studley, which is being promoted as “an artist-led studio, gallery and project space benefiting from a collaborative environment”, with studios, workshops, events and exhibitions. And as Matthew put it, he was curated to curate the exhibition there. The show consists of 25 works by various artists from countries including the UK, Germany and Romania, and is over two floors at the venue. The paintings are mostly abstracts, and include some by Matthew including the lagre and striking Southside (Lewis), a mostly-green abstract of his homeland. 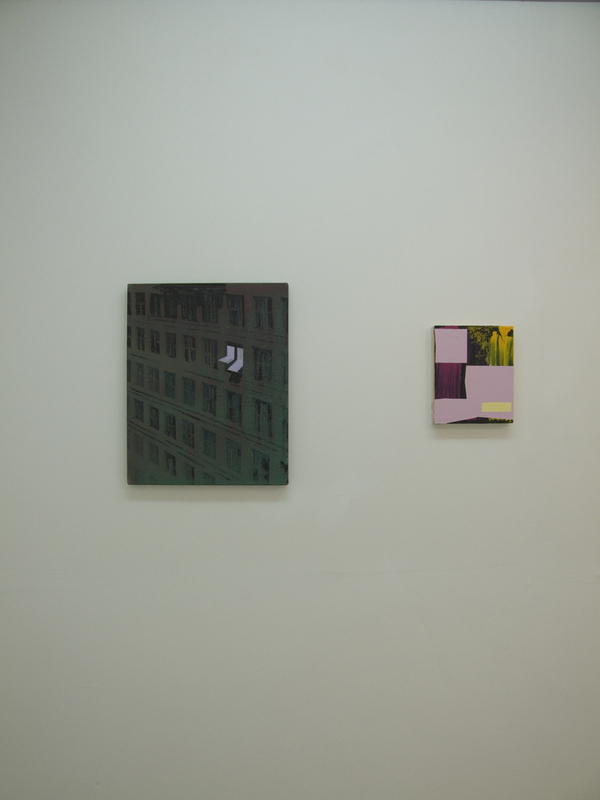 Three works by Coventry University lecturer Graham Chorlton actually feature windows in the paintings; in one, bright blinds seem to stick out of a dull-coloured building, and another looks like it’s painted from within a building in another country, with wooden blinds and attractive architectural buildings visible through it. New works by another Coventry University graduate Mircea Teleaga, now studying at the Slade, both called Untitled (Night Clouds) are also different to previous ones I’ve seen, with dark blue/black swirls of what could be water or clouds. Damir Sobota’s criss-cross stripes of colour are a big contrast. Terry Greene’s ‘Water s very important for life but we need it to wash our hands’ has the longest title but is a smallish work with a U shape in blue, and Erin Lawlor’s small works seem to consist of several large brush strokes. It’s an interesting exhibition in a good new space. Visitors to an exhibition celebrating the plays of Shakespeare in art may feel they are stepping on to the stage themselves. The exhibition at Compton Verney is arranged in eight acts focussing on different plays. It has been designed by the Royal Shakespeare Company’s Director of Design Stephen Brimson Lewis and this brings a dramatic air to the gallery spaces, and really enhances the exhibition. Entering Act 1 brings a disorienting feeling and it’s quickly clear that’s from the different slopes to the temporary wooden floor, with light shining through it, representing the shipwreck in The Tempest, and the sound of the sea. Works on show there include a large dramatic oil, The Shipwreck by Philip de Loutherbourg, showing two figures clinging to rocks. In contrast, there’s Antony Sher’s contemplative self portrait from 2009 of himself as Prospero. Karl Weschke’s image of Caliban shows a strange misshapen figure on the beach. 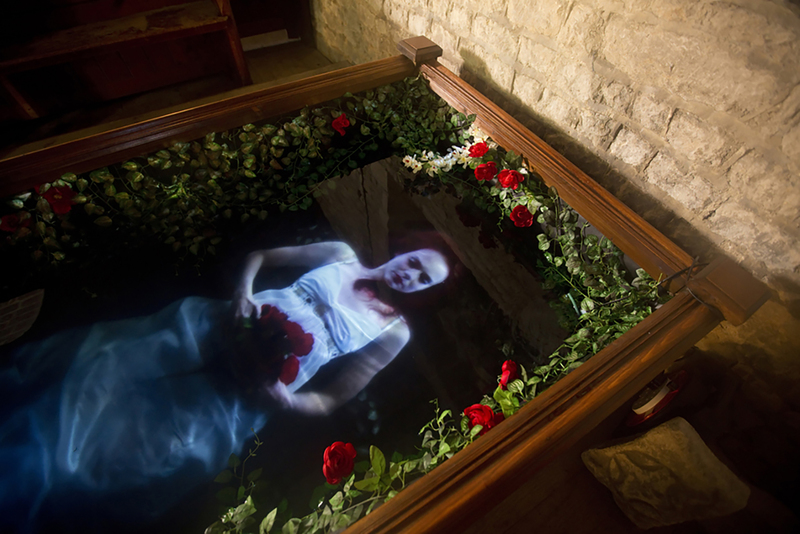 Act 2 explores the deaths of Ophelia and Lady Macbeth, and is dominated by a dark, carpeted side room featuring Davy and Kristin McGuire’s Ophelia’s Ghost (below), a holographic projection on to water. Kristin was filmed multiple times under water ‘drowning’ for this work which now looks beautiful and ethereal, the image seen through bubbling water and colourful flowers. Also featured are Simeon Solomon’s Ophelia from 1887, a Rossetti drawing of Lady Macbeth and Bryan Organ’s 1973 work, Ophelia after Millais, the drawing gird marks still visible. Above them all stands the dramatic tall portrait of a crazed looking Ellen Terry as Lady Macbeth by John Singer Sargent (below). A spooky soundtrack adds to the ambience. Act 3 celebrates the work of designer, director and writer Edward Gordon Craig, with some lovely, clean cut modernist woodcuts included. Act 4 features a new commission by Tom Hunter, in which he re-enacts Ophelia’s death in modern costume, in the Compton Verney lake. You walk below green foliage, and movements trigger audio recordings of plays in this gallery. Act 5 shows more of his dramatic photos showing samba dancers, a thrash metal band and Pearly Kings and Queens playing roles from A Midsummer Night’s Dream; the gallery is split up with a wall with a chink in it, drawing on a line from the play. Acts 6-8 features King Lear, Macbeth and Henry VIII. Henry Fuseli’s paintings from the late eighteenth century stand out for their dramatic use of light and dark, especially in The Weird Sisters and The Vision of Katharine of Aragon. 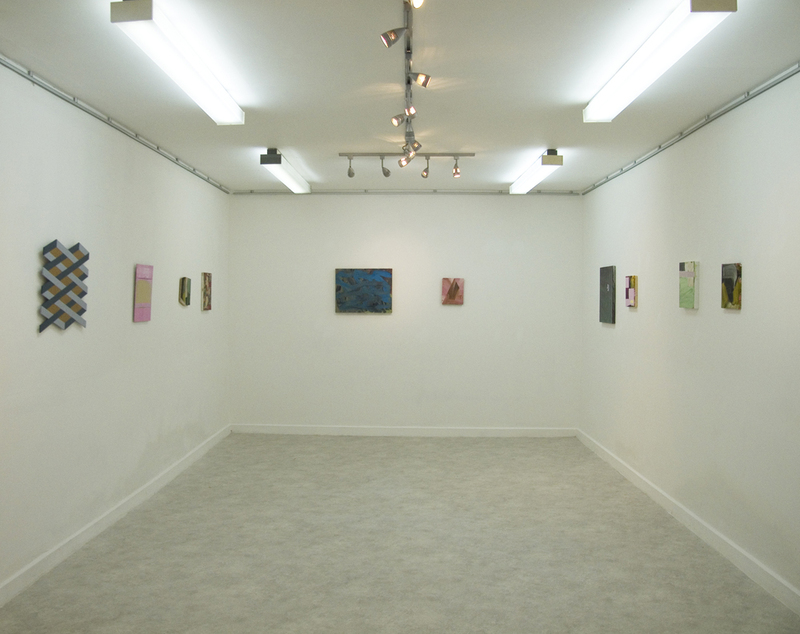 A room of his work features a silver floor and moving lights. Paired with Shakespeare in Art: Tempests, Tyrants and Tragedy, is Boydell’s Vision: The Shakespeare Gallery in the 18th Century, which examines the history of John Boydell’s gallery which opened in 1789 in London, using the Bard to develop a national form of history painting. It contains prints and paintings from that period, plus a digital re-enactment of what the gallery may have looked like. It’s interesting, but the main exhibition can take a bow for being an appropriately and enjoyably dramatic show.